A song relishing the bliss of knowing Jesus. "Love of my life, I long to know you, to ever gaze on the light of Your smile." Jesus Has become the love of my life, I so much want to know Him more and more. I want to always live with the joy of His smile over me. Not bashfully ashamed because of darkness in my life. "Jesus I love You, I praise you, adore you. You've given my life a new sparkle and shine." This is the song of one who is love-struck, filled with a undying first love for our Savior, gratefully remembering a soul rescued from sin and despair. I am so thankful to Jesus. His lifestyle, His life, is a life FILLED with blessings on every hand. He truly has taken this formerly bitter, angry, hopeless, despairing, compulsive sinner's life and made it sparkle and shine. Isn't it just like God to turn all that around! "to give unto them beauty for ashes, the oil of joy for mourning, the garment of praise for the spirit of heaviness;" (Isaiah 61:3) YAAAHOOO!!! The second verse is a picture of the bliss of knowing Jesus. Please take it personally, a glimpse of the personal joy of your salvation. Laughing, spinning, skipping through a green meadow, all the way down to a glittering river. Drinking in abundance of it's sugary sweet water. Fruits of all kinds, and all colors, each intricately delightful, falling ripe all around. So many that you can't possibly taste them all, though you're sure trying too. Lost, forgetting all time and thought in the love of Jesus. A heart bursting with joy! The green fields - "He maketh me to lie down in green pastures", and the whole chapter of Psalm 23. Skipping - Isaiah 35:6 "Then shall the lame man leap as an hart, and the tongue of the dumb sing: for in the wilderness shall waters break out, and streams in the desert;" Luke 6:23a "Rejoice ye in that day, and leap for joy: for, behold, your reward is great in heaven:"
River of pleasures - Revelation 22:1 "And he shewed me a pure river of water of life, clear as crystal, proceeding out of the throne of God and of the Lamb." I didn't even know this was a Biblical phrase when I wrote it, but it is, praise the Lord! Psalms 36:8 "They shall be abundantly satisfied with the fatness of thy house; and thou shalt make them drink of the river of thy pleasures." Drink till my heart overflows - Drunk in the Spirit... Ephesians 5:18 "And be not drunk with wine, wherein is excess; but be filled with the Spirit;"
Fruit falls like treasure - The Fruit of the Spirit; love, joy, peace, longsuffering, gentleness, goodness, faith, meekness, self-control (Galatians 5). Gifts of the Spirit. John 15:16 'Ye have not chosen me, but I have chosen you, and ordained you, that ye should go and bring forth fruit, and that your fruit should remain: that whatsoever ye shall ask of the Father in my name, he may give it you." Lost in Your love, and I'll ever be so - A life overwhelmed by an unfathomable love, forever lost in it's wonder. By the way, I had a great time writing this arcticle. 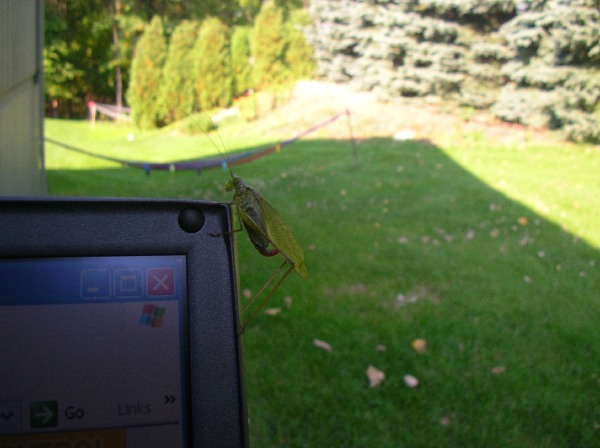 Here's a picture of when I was out side working on the computer. See, a grasshopper joined me for a while.